Police are investigating a car wreck on Long Island that killed a pedestrian and a driver Friday night. 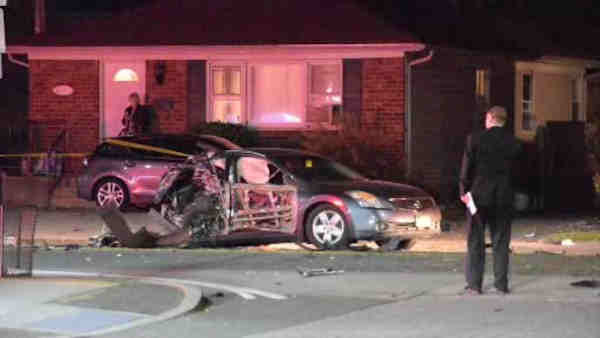 NORTH BELLMORE, Long Island (WABC) -- Police are investigating a car wreck on Long Island that killed a pedestrian and a driver Friday night. According to the Nassau County Police Department, around 9:30 p.m., Stephen A. Rossman, 20, of Seaford, was speeding in a 2014 Nissan Rogue, heading west on Jerusalem Avenue in North Bellmore. He hit the rear of a 2007 Nissan Altima, causing the vehicle to spin out of control. The Altima struck a 45-year-old female pedestrian from Wantagh as she was crossing north on Jerusalem Avenue. She was killed and pronounced dead at the scene. As the Altima continued to spin, it struck a 2013 Subaru traveling east on Jerusalem Avenue. The Rogue continued west, striking a dumpster. The dumpster hit a 2005 Nissan traveling west and damaged the rear of that vehicle. As Rossman's car came to a rest, it hit a 2006 Ford box truck parked on Jerusalem Avenue. Rossman was pronounced dead at the scene. The driver of the Altima was taken to a hospital for treatment of non-life threatening injuries. The drivers of the Subaru and 2005 Nissan refused medical attention at the scene. The identity of the second victim is being withheld pending notification of family.